Kalustyan’s is a great source for specialty groceries you can’t find anywhere else. Walk into the first aisle and you will find a wall filled with several different brands of bitters and flavored syrups. A little further down are another two cases of hot sauces. In the corner is another wall dedicated to different types of rice from black forbidden rice and saffron colored basmati to classic arborio and carnaroli. Yet another wall is dedicated to salts. Sea salt, black lava salt, Himalayan pink salt, and black rock salt are just few you might find. Another wall is brimming with every sort of dried bean you can imagine. The center aisle of the store is filled with large glass apothecary jars stocked with candied fruits and dried roots and vegetables. Dried herbs, spices, and additives for molecular gastronomy fill a second room. Head upstairs to check out their tea and coffee collection, or grab a quick lunch from their deli case of middle eastern specialties. They do both retail and wholesale business, and offer a discount if you pay cash. Products are also available for purchase on line. Another snowstorm seems like a good reason to stay in and have a kitchen project day. 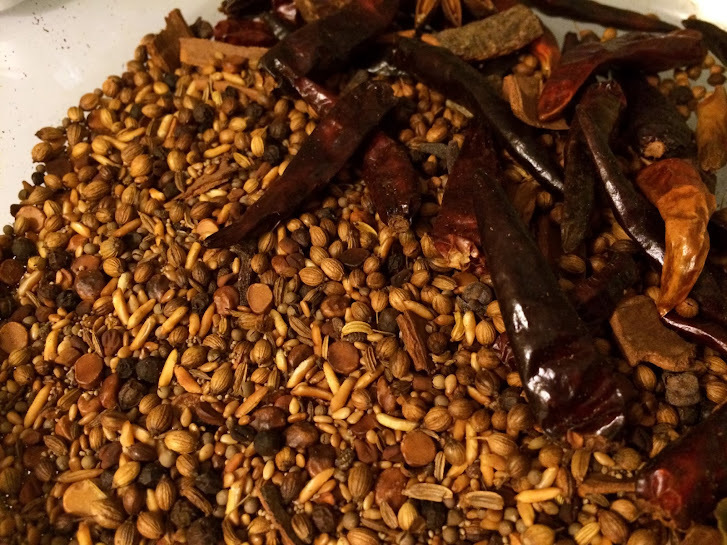 Today we are using our recent haul from Kalustyan’s to make some Indo style spice mixes. Anyone who has made Chicken Tikka Masala, Vindaloo, or Saag Paneer (my favorites) at home from scratch knows it’s a process that involves a lot of ingredients and spices. It’s easier to have spice mixes on hand, and better and fresher if you make them yourself. I’m new to Indo cooking, and have been using Raghavan Iyer’s 660 Curries as a starting point. The book starts with a good chapter on making standard spice mixes (masalas) and other pantry goods. Tags: Asian, Chef, Cooking, Food, Kalustyan's, Markets, Resources, Sources, Spices, Stores. Bookmark the permalink. Wouldn’t mind seeing your spice mix recipes online (or published in Saveur, other foodie mag. )….